i really am still not sure why i’m writing this blog. despite how little i care for that kind of justification, one can’t altogether avoid the occasional bout of self-doubt. 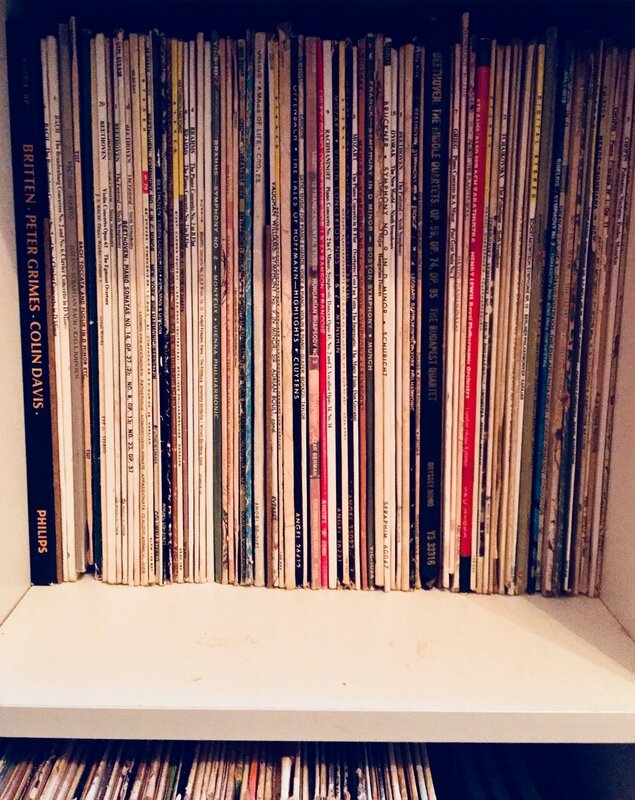 nevertheless, nevertheless, nevertheless—i write it; day in and out, each week with a freshness and rejuvenation that comes free of charge (save for the average of 75 cents each record costs). at the onset of this journal, the closest thing i had to a mantra was to get out of the way of the gratitude that pours forth continuously on the occasion of every new week; that is the Nietzschean attitude of la gay scienza, the utmost seriousness on the importance of a routine frolicsomeness. gratitude for how neat a parcel of time a week is: a week precisely long enough for a brief epic, and brief enough for the long procession of absolutely nothing happening. going into another 52 weeks, that mantra has not changed. and with every week i get better at getting out of the way of that gratitude that wants to pour, unstoppered, continuously. that is at least my one ineluctable superstition: i believe that at the bottom of every variety of human experiences; however far down one has to tunnel, however infrequently we realize it, the very foundation of our being is the waking awe at the beauty of here being here at all. aside from that, though not too far aside, is the much more consequential motivation for this journal, the sake for which this journal is merely a first attempt, a mere aperitif : i’ve come to take more seriously what i describe as a biological philosophy (borrowing the term from paul kalinithi’s When Breath Becomes Air). every time i’ve checked, i’ve been reassured of my initial suspicion: that i’m not much of a philosopher. or at least a philosopher in the way my education intended me to be. my prejudices, by way of peculiar experiences, reach too far down (and at once protrude from my surface!) to consistently maintain that lysol-clean tabula rasa upon which western philosophical tradition is erected. (though there are some magnificent exceptions to this tradition, one of which this journal has so far hinted at with a petty regularity: Friedrich Wilhem Nietzsche). —nevertheless, this issue of what i loosely associate as my ‘prejudices’ is rectified by a presupposition that is beyond the realm of speculation—(beyond good and evil as was the title of the aforementioned exception’s most notorious book)—that presupposition is that truth and reality are prejudices, thereby beyond the realm of justification. not prejudice on the part of any one mind (or some god-awful spiritus mundi) but prejudice in and of itself : that a rock falls when thrown is, in our sense here, a tremendous prejudice on the part of gravity. there simply is no alternative argument to convince this force to act otherwise. it is and couldn’t be any other way. in the most abbreviated sense: does not the same logic of this same force run through the fabric and sinews of you and i? it is not the path of determinism that i wish to tread here, but merely to hint at the possibility that much of what we are, indeed the very fact and beauty of being here at all, is a magnificent prejudice against not being at all. if one could temporarily endorse such a low resolution view of existence, then one might just be able to glimpse the possibility that so much of this tug-of-war between mores is not proof of the complexity of morality but the difficulty (and persistent denial) of facing up to what we are. that is, of finding out that very particular angle which our being necessitates, and the honesty to orient ourselves as such . yes, our very existence is a prejudice in a particular direction, the course of which morality tries to correct. putting aside whether or not this course needs correction, on my part i’m convinced that the task at hand is not further moral speculation but the realization of what the human animal is, at its highest and at its lowest. this task of realization is the business of a biological philosophy. realization is the crucial word here inasmuch as it is a mix of learning and admitting, of curiosity and honesty. these lines of nuance are the kind drawn over and over in Nietzsche’s literature: for example, that he sought an amendment to that famous socratic axiom to know thyself. for him, that still left too much room for dishonesty, so much of what we ‘know’ we are is little else that a persistent narrative. his amendment was to become who you are—the contradiction is the message. the image it should inspire is that of a muddy river slowly filtered of its debris. it’s landscape hasn’t changed much, it’s the honesty in regards to itself that has. —in short, a biological philosophy is merely a synonym to that becoming kind of honesty. instead of our godliness and d.i.y. spirituality, is our time not better spent kneeling at the feet of those experiences which our nature is—by its definition, it’s tremendous prejudice—inclined to? take for example the awesome magic of our musical experiences. yes, it is awesome, and absolutely: it is magic. or how else should one understand how melody erupts from the nether-regions of one mind only to thereafter dominate the foremost consciousness of another? the myth of athena is that she flew, fully formed, out of zeus’ cranium; fantastic as that image is, it could not compare to the reality of a waltz sprinkling forth from the bulbous forehead of a chopin. that we perform such real magic for each other is a tremendous prejudice against the infinitude of not doing so, and trying to find a justification for doing so is never appropriate. my upbringing was furiously religious. as such the common theoretical speculations regarding moral axioms have very little of an appeal to me. already at this age i’ve seen too much of the neverending, insubstantial, baseless accounts of why we’re here. again, that we’re here at all is a very decisive turn in a particular direction. my concern hereafter is only the equally endless but far more rewarding business of realizing what here is. that is again what i describe as a biological philosophy: to give utmost priority to explanations that spring naturally from our own existence, without any transcendent, spiritual justification. as soon as one has decided upon this priority, one merely has to turn one’s head in order to be compelled by the plethora of natural experiences for whose sake gratitude pours forth continually. this turning of the head is the entire scope of Nietzsche’s Gay Science. the musical experience is for me the most immediate example. the one that reveals most intimately, most effectively, how little we are in need of otherworldly, hinterworldly kinds of spirituality. our skulls are, as they are, packed full of magic. the things we can do with our self-styled instruments can fetch emotions too deep for tears, can charge a phalanx of soldiers bravely into a hopeless battle, are giants that can shoulder all the tiny goblins of godliness. for those who have placed their highest meaning in whatever version of a personal god, it is an immeasurable joy to rediscover this same galactic spirituality in the hands of other human beings, especially of musicians. magic made by flesh and bone and blood—i’d take that over any promise of heaven any given day. the third rule is: collect vinyl. they are flat little pucks of magic. hold a stack of them in your hands, and be inconsolably grateful. the fourth rule is to cultivate a routine of musical experiences. continuity and routine are the tithes of a biological philosopher—for there is no end goal, no paradise, absolutely no hereafter and especially no sabbath. find what’s good and do it till you’re all crumpled up.—at least that’s what i’m up to here, nothing more and hopefully nothing less: 30 composers in 52 weeks. that is the plinth of my musical education, for now…. ( god willing and the creek don’t rise).